Yo Gabba Gabba Live! in NYC! 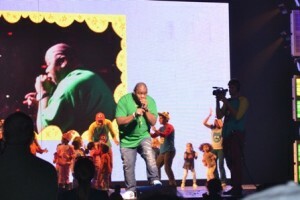 Over the weekend I took my toddler to see a live performance of Yo Gabba Gabba. I didn’t know what to expect from my toddler who is rambunctious in the comfort of her home, but reserved when she is out in the world. We headed over to Beacon Theater and hoped she would enjoy everything the show had to offer. As the show started and the theater got dark, my toddler creeped into my armpit, not really sure what to expect. She knew she was there to see Yo Gabba Gabba “in person” but I’m not sure she understood what that meant. As her favorite characters bounced on stage, her eyes widened and her interest grew. She still was very reserved but once she started to hear familiar songs she started jumping on her seat and dancing. I have been accused of stating that I think some kids, mine included, are too young for shows like this. The expense alone makes it not worth it – BUT I have since changed my mind. My family got to spend a great day together and my toddler keeps talking about Foofa dancing on stage in front of her. She had an amazing time and a great experience. Now that she is two and at an age where she can possibly remember these experiences, I will be taking her to more kid-based shows around the city. There was something for everyone at Yo Gabba Gabba live. Celebrating the “New York City” way, a special guest, Biz Markie made an appearance. I’m not sure if he will be on the entire tour with them, but since he is a NY native, it was a great surprise for my hubby and I who remember his beats growing up. Biz’s Beat of the Day had the entire crowd up and dancing – parents included. I loved that the show was interactive as children were pulled on stage and asked to practice Biz’s beats with him. 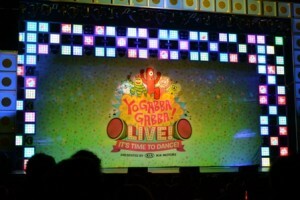 All in all we had an amazing time at Yo Gabba Gabba Live. I highly recommend this show to all Gabba lovers and even the occasional Yo Gabba Gabba viewer. Check out Yo Gabba Gabba Live to see if they are coming to your town! Disclosure: I received complimentary tickets to attend the event. All opinions are my own. Previous Post: « Don’t you love the Terrible Twos? I was also at the show at the Beacon Theater (I was at the Sat. 5pm performance) with my 20 month old. He was freaked out about the lights being off, and pretty reserved throughout the show, but he had a good time. How old is your daughter? I wonder if the few months makes a big difference. Wow sounds like that would of been a fun time!